A HILLSBOROUGH woman has raised £8000 for local mental health charity, Aware Defeat Depression, with the help of her friends and family. 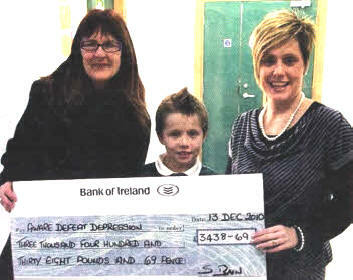 Sara Bain, nee Smith, managed to raise the massive sum through various events including sponsored walks. Several months ago a group of seventy people climbed Slieve Donard in the Mournes. The event was in memoriam of Sara's twin brother Roger Smith who took his own life. This is the second time Sara has rounded up friends and members of the Smith/Bain families to participate in the walk to raise money for Aware. In each case, she rewarded everyone's efforts afterwards with a family picnic and barbecue. In total the families have now raised a fantastic £8000 for the charity which will be used to help make the public aware of the signs and symptoms of depression and how the charity can help people to get better. Sara explained: "My family chose to support Aware Defeat Depression because more people need to be aware that there is help out there if you are depressed. My brother and his family didn't get the help they needed at the time, largely because we did not know about Aware Defeat Depression. We wanted to raise awareness through our walk as well as money and so we distributed lots of leaflets and spread the word on Facebook, which seems to have really helped." Alison Smyth, spokesperson for Aware Defeat Depression said: "Aware is extremely grateful to the Bain family for their hard work organising this annual In Memoriam event. We appreciate every donation made to us because money from the public allows us to continue with the work we do to prevent further suicides." A support group member from the local Lisburn group said: "I found the simple concept of people affected by depression meeting, sharing experiences, giving and getting support was very powerful. This was undoubtedly the turning point in the road to my recovery." The Lisburn group meets at the Bridge Community Centre, 50 Railway Street, at 7.30pm every Thursday and there are twenty other support groups across the province for people with depression. The charity also delivers life skills training and goes into schools to talk to young people about looking after their mental health. For more information on the support groups in your area, or the other work Aware Defeat Depression does, visit www.aware-ni.org. The helpline is also available from Monday to Friday, 9am - 1pm by calling 08451 20 29 61.